On February 12, Shibir students sleeping at night at Rajshahi University - Mustafizur Rahman and Ismail Hossain Sirajee attained martyrdom in a surprise attack by Chhatra Dal terrorists. 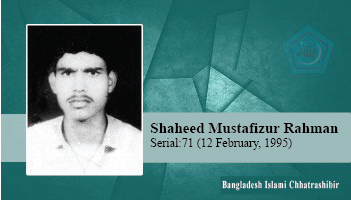 (1) Last year student of MSS (Economics) of Rajshahi University, Mustafizur Rahman's house was at the Alamdanga Station Road in Chuadanga district. (Ii) Ismail Hossain Sirajee, a resident of Chala village of Belkuchi police station of Sirajganj district, a student of 1st year of Bangla Department of Rajshahi University.